I recently purchased a 2009 Ford F150 Lariat 4x4 truck and was blown away by all the features it has. Now lets not get into the age-old "Ford Vs. Chevy Vs. Dodge" debate as that could go on for days and it never accomplishes anything. However, there is one feature in my Ford that I think almost any vehicle owner would want... and that is Sync by Microsoft. I have to say that I was skeptical at first of all its claim, however it has been so easy to use along with my 8330m and all my pessimistic notions are gone! So enough of the entry, lets get into the details. When you first pair up Sync with your Blackberry it walks you through a very simple procedure, offering you a security pairing code on the screen, and guiding you through each step in sequence. Once paired you are able to transfer your phone book contacts which the Blackberry automatically defaults its settings to allow this. Once transferred, Sync allows the operator to handsfree (well almost considering you do have to push the button with your finger) activate their phone, media choices, and give commands for each. When pressing the Sync button, I am greeted by a female digital voice... we'll call her Olga. Olga says "Sync, Please say a command" and I feel obliged to respond "Phone." To this, Olga responds asking me to say the name of the person I wish to call. I must say that I have never used a voice activated dialing system that required no setup, and had such great results! Even the native voice dial on the phone has at times left me bewildered as to who I called, knowing that person was not the intended recipient. Sync also allows you to browse your recent calls, phone book, and redial however it prefers you do this while stationary as a safety precaution. Sync performs a Vehicle Health Report that is emailed to you and accessible via SyncMyRide.com as well as in the event of an accident automatically dials 911 through your cell phone with the "911 Assist" feature. At times when it can not understand, it offers suggestions and asks you to press or say 1, 2, or 3 (each, respectively, a different contact). The only negative that I have noticed in my first week of use, is that the volume on the Blackberry defaults to around 50% and I so far have been unable to change this. I have turned off and on the echo control, set the volume from previous to 100%, and restarted the phone a few times unsuccessfully. 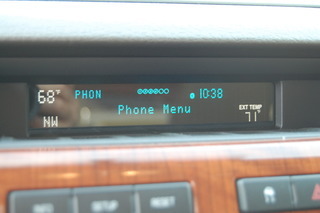 However, a small turn of the volume dial in the truck and everything is fine. Those on the other end of my invisible string-tied-between-soup-cans also say that I sound very clear and crisp most of the time. Another built in feature of Sync is Bluetooth Media Streaming! Now I must admit at first I was unable to get this to work, however a few days later while playing with Pandora, I reset the Bluetooth Streaming setting in Pandora and it began to work. While my truck is equipped with Sirius Satellite Radio free for 6 months, Sirius is not tailored to my specific music taste. Enter Pandora with its intuitive music engine and its eager desire to serve up my favorite tunes. I also have AM/FM radio and a 6 CD changer, though I haven't used them yet thanks to Bluetooth Media Streaming (and the USB port though this doesn't pertain to the Blackberry directly). 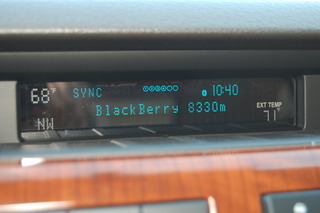 With all these great features Sync and the Blackberry offer me as the driver, its hard to say why I'd ever leave my truck! (Did I mention I have seat heaters and seat air conditioning?) 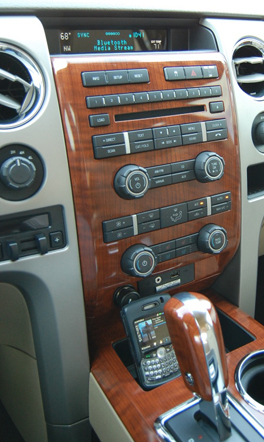 So if you're in the market for a new vehicle, and you constantly find yourself wearing those ridiculous Bluetooth headsets or trying to keep a vehicle speaker phone charged, you may want to check out Ford and their vehicles equipped with Sync. Tell them Crackberry.com sent you!